Let your skin reap the benefits of hyaluronic acid which penetrates beneath the skin's surface for maximal moisturization. Cellex-C Hydra 5B Complex is most effective when used after serum and eye contour gel, or before the skin firming cream plus and eye contour cream plus. The seemingly miraculous active ingredient is pure hyaluronic acid—one of the most effective moisturizing agents ever discovered by medical science. Hydra 5 B-Complex utilizes natures own incredible moisturizer to improve the smoothness, suppleness and texture of your skin. Identified biochemically as a glycosaminoglycan (GAG), hyaluronic acid was isolated about sixty years ago from vitreous humor. It’s name is derived from the Greek word for glass—hyalos—which accurately describes its transparent, glassy appearance. The surface layers of the skin are supported from below by columns of fibers made up mostly of collagen and elastin. This network of fibers form the ‘molecular sponge’ known as connective tissue. The spaces within this sponge are filled with a composition of water, protein complexes and hyaluronic acid. This jelly-like complex is necessary for transportation of essential nutrients from the bloodstream, via the capillary network, to the living cells of the skin. Hyaluronic acid is a natural substance found in great abundance in young skin, synovial fluid and other tissues in humans and animals. Over time, oxy radicals, produced mostly through exposure to pollutants and sunlight, degrade and destroy hyaluronic acid. Fifty year olds are estimated to have less than half the hyaluronic acid they had in youth. 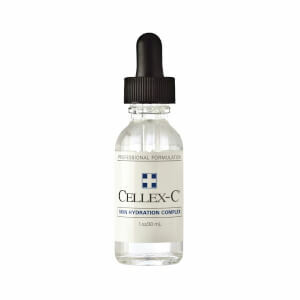 Cellex-C Hydra 5B Complex contains genetically derived hyaluronic acid not an animal derived substance. Contains pantothenic acid (vitamin B-5). Studies show that this vitamin helps speed wound healing. 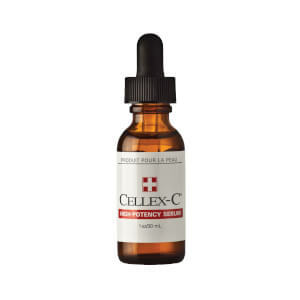 Cellex-C Hydra 5B Complex can be used by men and women including those with sensitive skin. Supplements the skin’s natural biological replacement of hyaluronic acid. Skin feels more resilient and extraordinarily smooth to the touch. Perfect base for all types of make-up. Smoother, more radiant looking skin will be noticed in 3 — 6 weeks. Water (Aqua), Sodium Hyaluronate, Pantothenic Acid, Phenoxyethanol.